This set of 8 large serving spoons from the late 18th through the early 19th century chronicles one Swiss family's history. for the same family is very rare. Despite extensive research I have not found anything comparable to this set. Wedding and marriage customs vary significantly from culture to culture and from religion to religion and from province to province and tribe to tribe. 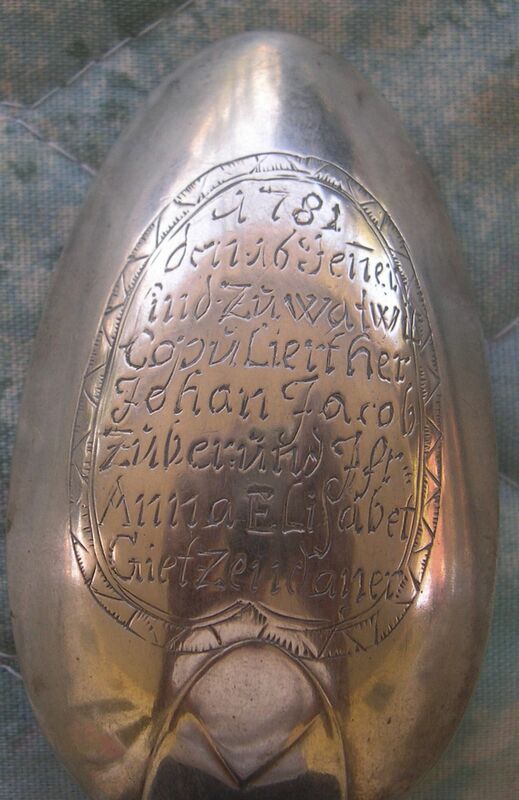 The custom of engraving the initials of the bride and groom and a date onto a valuable silver spoon was mainly central European but spoons so engraved have also been found in England, the USA and elsewhere. For a newly married couple sharing a common meal made the spoon an obvious choice. 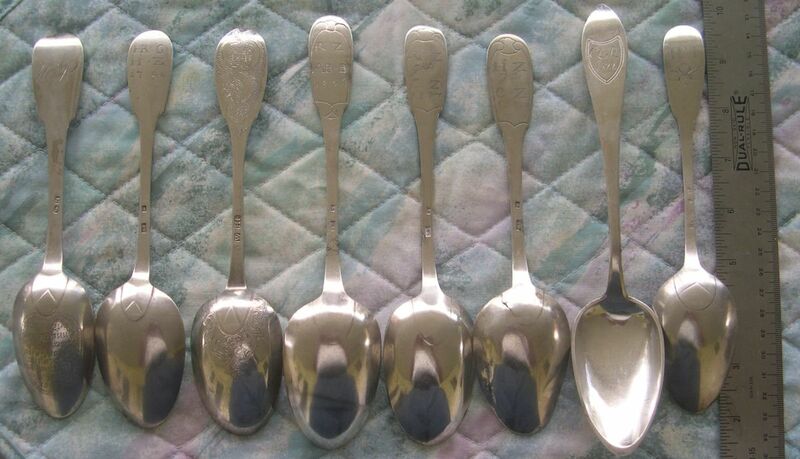 My expertise lies with late 19th and early 20th century silver spoons, so I am presenting the spoons and asking my readers for their help. As you can see all of these spoons have engraved initials, names and dates. 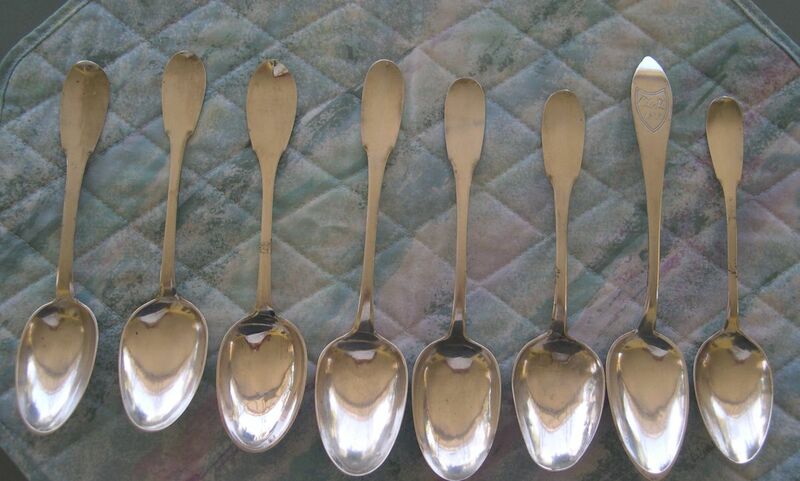 I have placed the spoons in chronological order so that you can also see how the styling of spoons changed during the 1771 to 1822 time period. All of these spoons appear to be hand made and appear to be a silver alloy, but I am unsure of purity. I suspect that 800 silver was used. A couple of the marks I was able to trace to Wil, Switzerland (the third largest city in the canton of St. Gallen) and I suspect that all of the spoons probably came from that area. Styles of spoons have changed over the years and these spoons were custom made, so the prevailing style popular at that point in time would have been used. Some of the spoons are in the uni-plat (French) style. Others have bent tipts style and others are variations of the 'Old Engish" style. Five different sets of silversmiths marks are represented on these spoons. 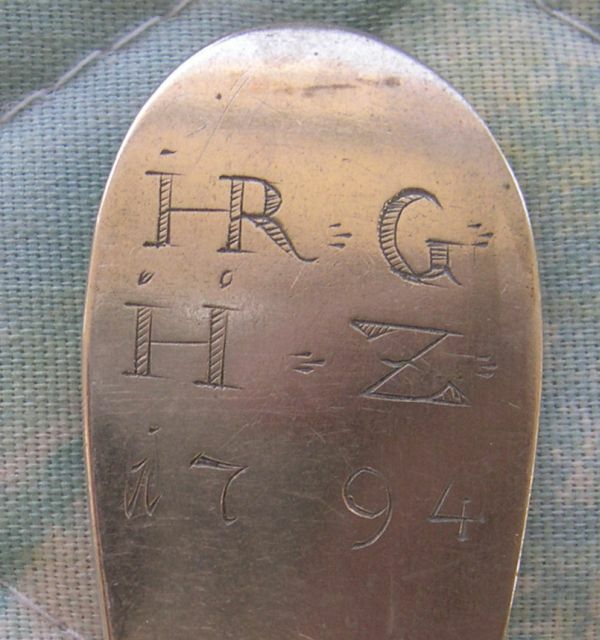 This is the oldest and most intriguing spoon of the set as it lists the names of 7 people (a pretty difficult engraving task on the back of a curved surface) along with the date of 1781. One of the names (Johann Jacob) is very similar to the founder (Schweppe) of a major brewing company during this time period, but I cannot at this time confirm that it is the same person. I am also unsure as to the reason all of these names are listed on this spoon. 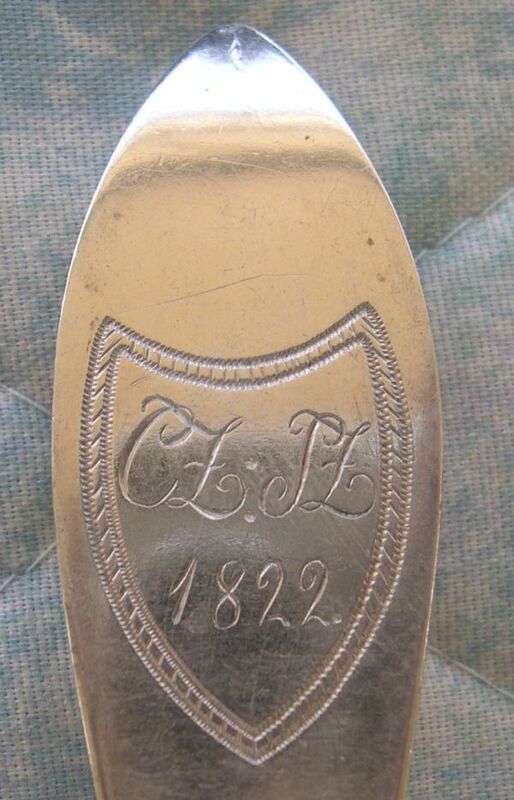 This 1795 spoon has the prettiest engraving on both the finial and the bowl. 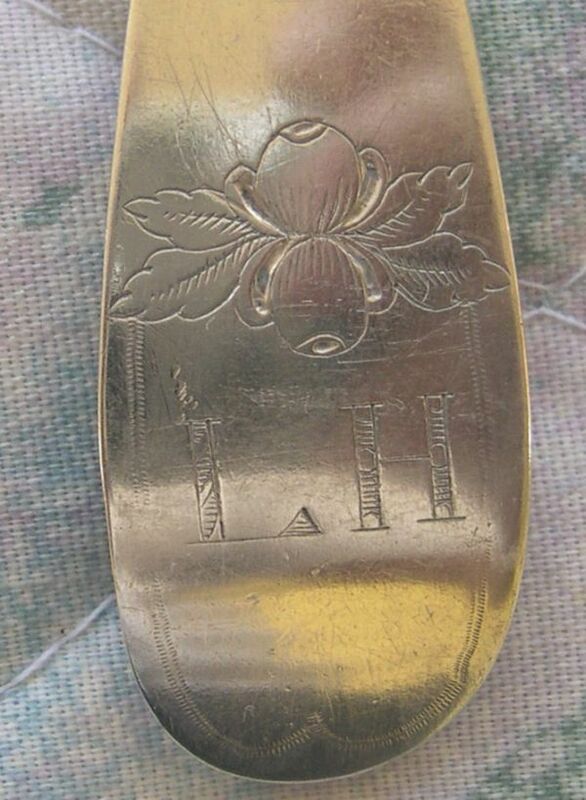 It looks like two sets of initials so I am guessing it was a marriage spoon. Again two sets of initials. 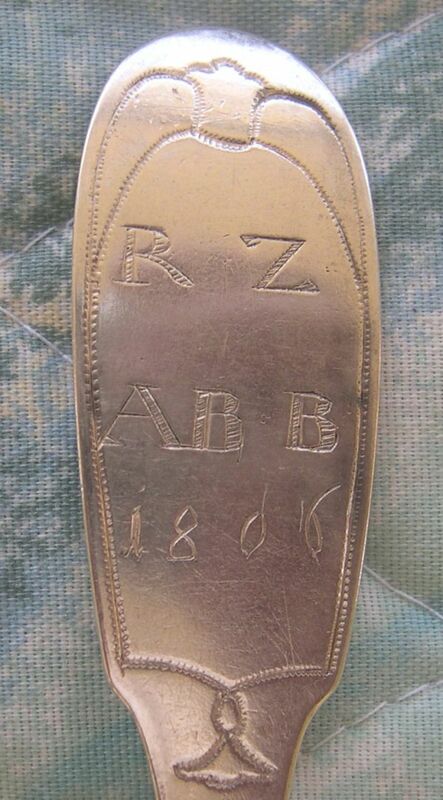 However you can see the 1806 date was scratched into the metal by someone who was not a trained engraver. I suspect that it was done sometime after the spoon was made when someone was documenting the family history. 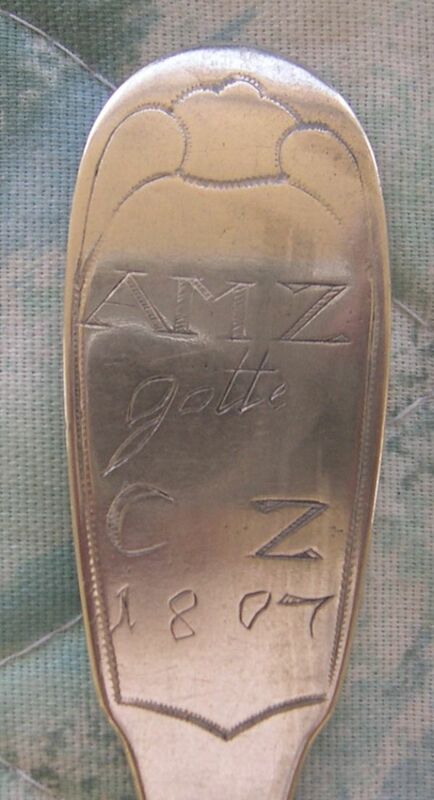 Again two sets of initials implying a marriage spoon, but also the word "gott" and again you can see the 1807 date was scratched into the metal by someone who was not a trained engraver. "gott" is a German word that translates to "god" or "godmother" and it was also scratched into the metal. 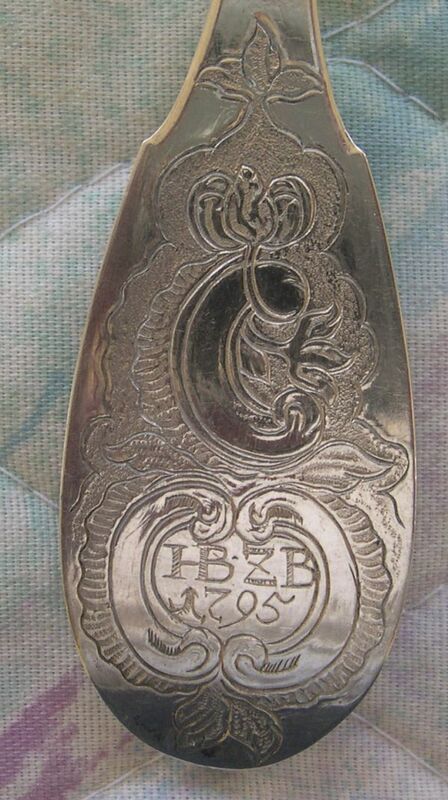 This spoon has ony one set of initials and I do not know if it was meant to be a birth or funeral spoon. It is also undated. 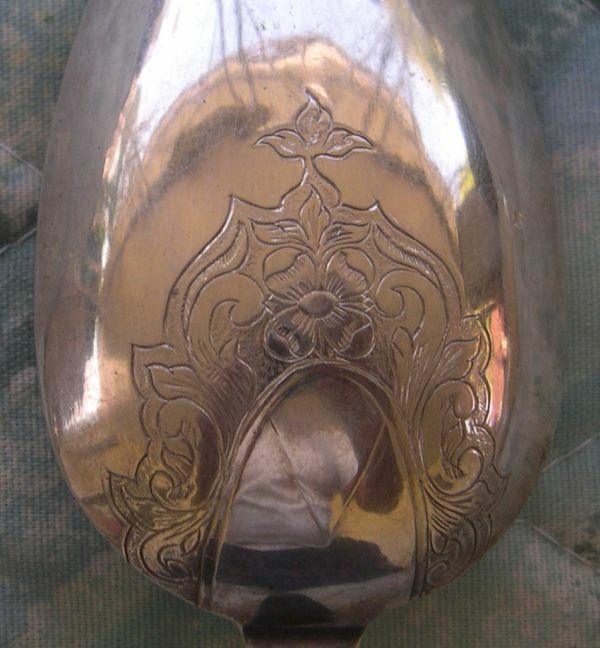 I suspect that the engraving is supposed to represent a flower. 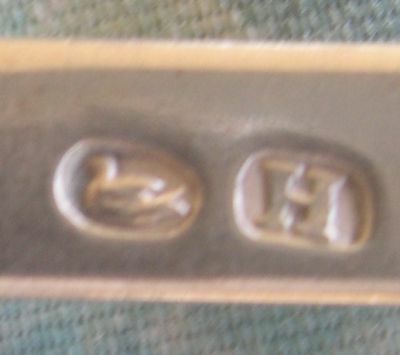 Swiss silver expert, Charles Cage, has graciously provided me with further information on some of these marks. 1. 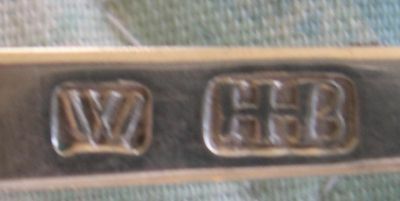 The “R.B” mark is recorded but not identified. In the references I have, it is not accompanied by any city mark, so the Wil connection may be a clue to the maker’s identity. Unfortunately, I cannot connect it to any Wil maker at the time with those initials. 2. The “HHB” mark is possibly an unidentified maker in Wil, but more likely that of Hans Heinrich Bösch (1752-aft. 1790) of Wattwil, a small town about 13 miles south of Wil (both canton St. Gallen). 3. The “H/bird” mark is from Herisau (canton Appenzell), the “H” being the city mark and the bird the maker’s mark. It is known from church records that chalices with this mark were supplied in the last third of the 18th century by a maker with the surname Frehner, and indeed the bird matches the Frehner coat-of-arms. The maker’s Christian name is not known, but several of his descendants were also silversmiths, such as Johann Jakob Frehner (1828-1876). 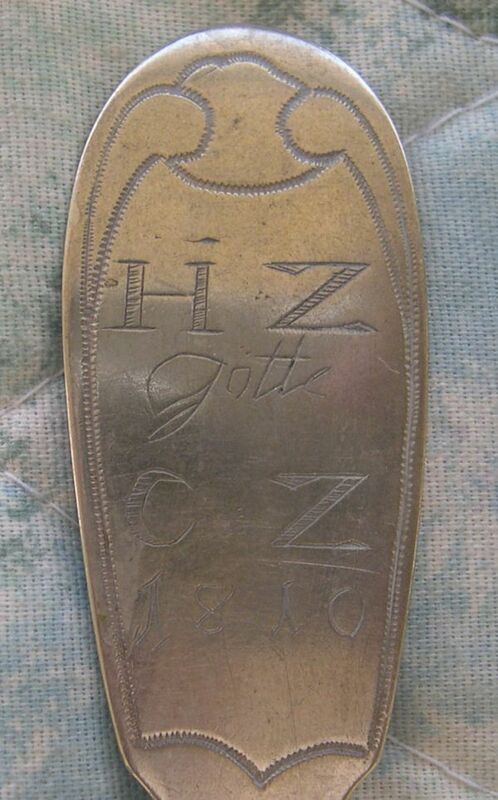 4. the “GW/L” mark is from Lichtensteig (canton St. Gallen), the “L” being the city mark, and “GW” the mark of silversmith Johann Georg Wörpel (1787-1831; Master 1813), who was orginally from the city of Preetz in the Schleswig-Holstein region of Germany. These marks are " from Zurich, canton Zurich. The two central marks are the Zurich city mark and the assayer’s mark, both worn but certainly those used 1792-1806. “CW” is the maker Hans Caspar Wüest I (1766-1845, master 1787), and “CL” is the retailer Conrad Locher (active 1789-1799)." English seal top and trifid spoons from the late 17th century are sometimes found with engraved initials indicating they were wedding spoons.